The unfolding crisis between Turkey and the Netherlands has been provoked by Dutch domestic politics, Turkish Prime Minister Binali Yildirim said, adding that the harshest possible response is soon to follow. “It seems the Netherlands has internal issues. General elections will be held on March 15. We think what we have been through today because of this election is based on internal politics,” he told local broadcaster TV24 on Sunday, as cited by Anadolu news agency. The Netherlands is holding parliamentary elections in mid-March, and various polls suggest that the far-right anti-immigration Party for Freedom (PVV) led by firebrand Geert Wilders is likely to emerge as the kingdom’s most popular party. Wilders will be competing against Prime Minister Mark Rutte’s liberal VVD party. “Our beloved nation should know that we will retaliate against this unacceptable treatment of Turkish ministers bearing diplomatic immunities,” the prime minister stated. He also urged emigre Turks living in the Netherlands, Germany, and elsewhere in Europe not to remain silent, but to “act with common sense,” saying the best response to the mistreatment of Turkish officials and “these fascist practices” is to take part in Turkey’s April constitutional referendum, which would extend Recep Tayyip Erdogan’s presidential powers if approved. A spat unfolded earlier this week when senior Turkish officials were barred from appearing at rallies being staged to drum up support from for the referendum among Turkish expats in the cities of several other European countries, including Germany and Austria. 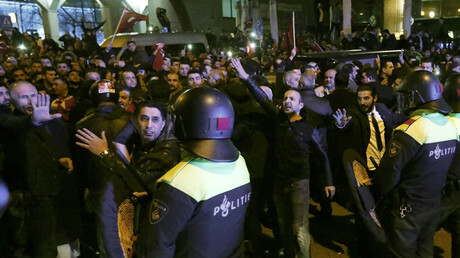 As the spat with the Dutch escalated on Saturday, Ankara sealed off the Netherlands’ embassy and consulate, while also closing off the residences of the country’s ambassador, charge d’affaires, and the consul general, sources at Turkey’s Foreign Ministry told local media. In addition, Erdogan labeled the Dutch “Nazi remnants” and “fascists” after they revoked permission for his foreign minister’s aircraft to land in the Netherlands for a scheduled visit to speak at a rally in Rotterdam.